I routinely check with my stone supplier. This last time, I selected two stones. One was Turkish marble and the other was Turkish granite. Something about its texture of the latter fascinated me, and it wasn’t until I began to sculpt the stone, that it occurred to me why. 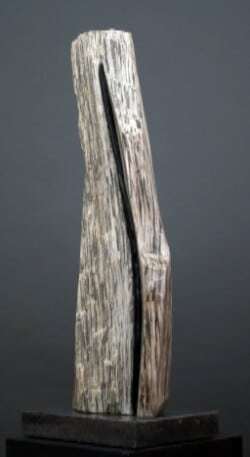 Often the direction of the grain, or striations in the stone, give me a sense of direction and inspiration. I began to “see” my design take form as I followed the natural striations as I worked with the stone. Midway through, I thought that a “touch of Black Chlorite stone” would add a touch of contrast and yet another degree of interest to the beauty of the granite. Over the past couple of years, I have had opportunities for travel and, until now, I hadn’t consciously realized that my journeys are beginning to influence my designs. It wasn’t until I completed this work that I realized its design must have been influenced by my travels to the western US, especially from the rock formations found in Utah my latest work evolved…hence its name….Zion SPIRIT.. For a “hands-on” experience, please come and visit Zion Spirits, now on display at a juried art exhibition, “Positive/Negative” being held in Ft Myers, Fl. At the Sidney & Berne Davis Art Center ,2301 First Street, Ft Myers June 2- June 26, 2017.